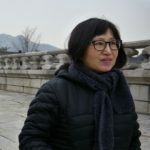 Born in Seoul, South Korea, Don Mee Choi is the author of Hardly War (Wave Books, 2016) and The Morning News Is Exciting (Action Books, 2010), and chapbooks Petite Manifesto (Vagabond Press, 2014), Ahn Hak-sôp #4 (The Green Violin, 2018), Sky Translation (Goodmorning Menagerie, 2019), and a pamphlet of essays Freely Frayed (Wave Pamphlet #9, 2014). She has received a Whiting Award, Lannan Literary Fellowship, and Lucien Stryk Translation Prize, and is currently a 2019 DAAD Artists-in-Berlin Program Fellow. She has translated several collections of Kim Hyesoon’s poetry, including I’m OK, I’m Pig! (Bloodaxe Books, 2014), Poor Love Machine (Action Books, 2016) and Autobiography of Death (New Directions, 2018). “Suicide Parade” from Hardly War. Copyright 2016 by Don Mee Choi. Used with permission of the author and Wave Books.